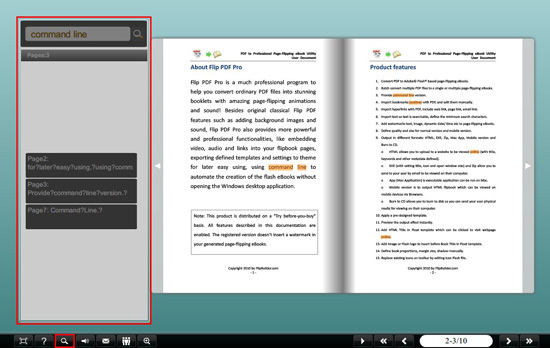 Flip PDF FAQ - Can I search the contents of the flash catalog. Can I search the contents of the flash catalog? Some of you may encounter this: I have a long catalog that converted into flash format pages. Now I have to find a paragraph from hundreds of pages, which would have killed me. Are there any quick ways to help me with this mass? Of course, you can set a search button to search the paragraph by typing some key words. 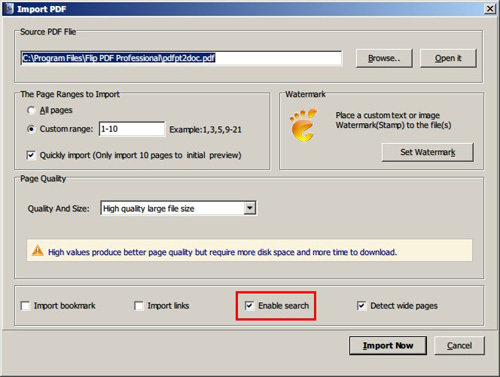 First, which is important, when importing PDF, do remember to check the “enable search” option. Otherwise, the search button won’t work if you don’t check this option. Second, now you have to do some settings for the search button. 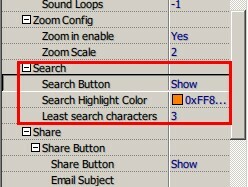 Like the searched content highlight color and least search characters. After applying all these settings, try to click the “search” button on the toolbar, a search bar will popup; enter key words and push Enter button, searched contents will be shown.